Have you ever fallen in love with a plant at first sight? We have many times. 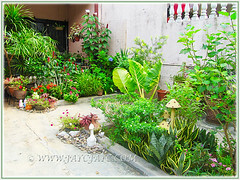 It was instant love when we saw these potted plants with strikingly beautiful variegated foliage. They were chanced upon at a nursery along Sungai Buloh road in early November 2013. Hence without hesitation, we delightfully brought home a pot. It cost us only RM12 and we deduced that it was pretty cheap for such an attractive beauty. A hardy plant that was repotted into a large pot and relocated to the front yard, sometime in July 2014. Looking at its marvellous growth now after replanting it into the ground at the outer border in March, really put wide smiles on our faces. The Variegated Giant Elephant Ear seems very contented in its current location where it gets to sunbathe in morning to early afternoon sun.. The stems now are coloured buttercup-yellow and the large leaves are much more speckled and prominent. 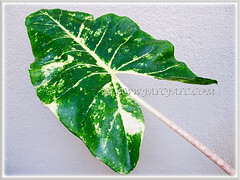 Could our plant now with more yellow blotches in a sunny location be the cultivar, Alocasia ‘New Guinea Gold’, I wonder? Truly a spectacular and exotic tropical beauty! 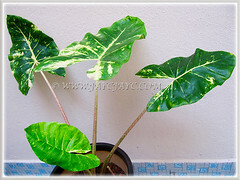 Botanical Name: Alocasia macrorrhizos ‘Variegata’ (syn. 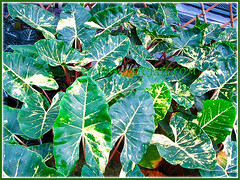 : Alocasia macrorrhiza ‘Variegata’, Arum indicum, Colocasia indica). 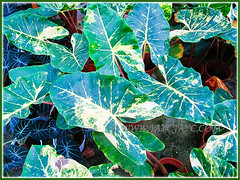 Common Name: Variegated Giant Elephant Ear, Variegated Giant Alocasia, Variegated Giant Taro, Variegated Upright Elephant Ears. Origin: Native to the tropical Asia, from Indonesia, Malaysia and the Philippines, Queensland in Australia and the Solomon Island. Also, naturalised worldwide and widely cultivated. Plant type: A herbaceous and evergreen tropical perennial. Features: Alocasia macrorrhizos is a species of flowering plant belonging to the genus Alocasia that consists of about 79 species. In its native green form, this enormous plant can reach heights between 2.5-3 m and produces impressively large, highly ribbed and solid green leaves, measuring more than 60 cm wide and 120 cm long. 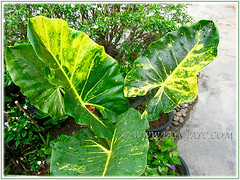 ‘Variegata’ or ‘New Guinea Gold’ is a cultivar with marvellous foliage variegation. The glossy leaves are strikingly mottled in lovely hues of jade-green, yellow, cream and white, some more variegated than others. Simply glorious as each leaf is uniquely speckled and no two leaves have the same variegation. The underside of leaves, brightly ribbed in yellow are as lovely too. Young plants have pinkish petioles that turn mostly yellow as it ages. The new leaves will push out from the centre within the innermost leaf stem. Under good-growing tropical conditions, the butter-coloured leaf petiole or stem can grow to about 8-10 cm in diameter and 1 m high. The large and upright, A-shaped or heart-shaped leaves are held on stiff upright petioles too. Hence, the plant is aptly named Upright Elephant Ears. It’s a fast-growing, evergreen herbaceous perennial that can reach 1.5-2 m in height or more. 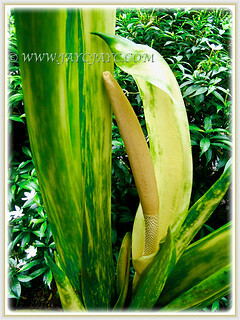 When matured over time, the plant will produce an inflorescence with a rod-like pimply-surfaced spadix with tiny flowers and enclosed in a hood-shaped leathery spathe or leaf-like bract. If the flowers are pollinated, they will be followed by numerous seeds that can be used to propagate new plants. 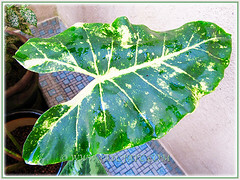 Culture (Care): Alocasia macrorrhizos ‘Variegata’ grows easily with least care. Light: Light shade though best in full sun for optimum growth and striking and vibrant foliage variegation. Semi-shade if you prefer smaller growth. Moisture: Moderate to high water needs. Water regularly to keep it moist but never water-logged. It loves a warm and humid environment. Soil: Grow in loose organic-enriched and well-drained soils. 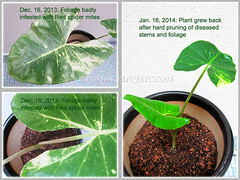 Others: Cut off burnt and old leaves to encourage new fresh leaves to emerge. Wear a pair of rubber gloves when cutting the leaves if you have skin allergies when in contact with the sap. Sometimes, a tall plant may need staking to avoid falling over during heavy winds and thunderstorm. Thus, to replant a matured bulb, it’s advisable to plant it a little deeper than required, at least about 20 cm deep. Feed once monthly and lightly with a balanced organic fertiliser, one that provides healthy growth and flower production. Generally free from serious garden pests though watch out for spider mites that love dry and dusty conditions. Hence, keep the leaves free from dust by wiping or spraying water on them regularly. Since it’s not frost tolerant, advisable to grow indoors as a houseplant or in a green house with sufficient bright light and accepted temperature. Alternatively, you can grow it in a large pot, outdoors during the hot seasons and overwinter indoors during winter. During cold weather, reduce watering for young plants to prevent rotting tubers. Read some comments from gardeners at Dave’s Garden. Propagation: By sowing seeds if available or by bulbs. 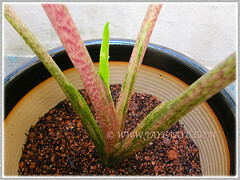 You can also separate the suckers or plantlets that emerge beside the tuberous parent plant and replant them. 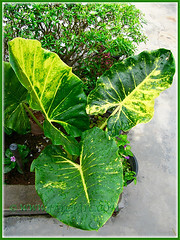 Usage: Alocasia macrorrhizos ‘Variegata’ is popularly grown for its ornamental foliage. It can be grown on the ground, in a large pot or raised planters. Plant it as a standalone garden specimen and as a backdrop in a garden border amongst other green foliage plants. 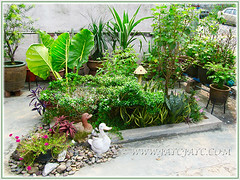 Suitable as a landscape plant in parks and interiorscaping in shopping malls. 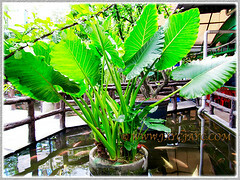 An ideal and exotic plant for water gardens, fish ponds and bogs. The Giant Taro is known to be cultivated throughout South-east Asia and the South-west Pacific for its edible stems. The stem contains irritant calcium oxalate crystals that are rendered harmless through thorough cooking. 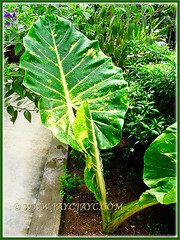 We never knew that Alocasia macrorrhizos ‘Variegata’ or Variegated Giant Elephant Ear will flower! Such wonders for home gardeners like us. What an awesome and fabulous treat! It had been blooming a couple of times ever since it first flowered in August 10, 2017. What marvels the Almighty God has created for our viewing pleasure!